NEVER PAY OVERWEIGHT BAG FEES AGAIN! The EatSmart Precision Voyager digital luggage scale is a practical solution to most airline luggage restrictions*. 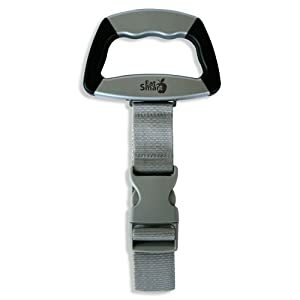 Simply clip the EatSmart buckle to the handle of a suitcase or bag. EatSmart's proprietary two handed SmartGrip design allows for easier lifting of even the heaviest bags. Lift the bag and the scale will beep when the weight has been determined and appear in the large backlit LCD. Push the ON/OFF button and the scale resets to zero for the next bag. The scale is compact, lightweight and durable so you can take it along for the return journey. The Precision Voyager is a practical solution from the casual vacationer to the road warrior! *Most airlines now impose a strict 50 lb. weight limit on bags per person. Check with your individual airline before flying. When planning to travel with kids, especially on a budget, one of the things that is most important is trying to avoid unnecessary fees and that's where the EatSmart Precision Voyager Digital Luggage Scale w/ 110 lb. Capacity & SmartGrip comes in so handy! By being able to weigh each piece of luggage before you leave home and packing the luggage scale into your suitcase for the return trip, you save yourself the guesswork and fretting in the airport baggage check line. With airlines getting stickier and stickier about weight restrictions and limits, being caught unawares and paying hefty fees is happening more and more. The EatSmart Precision Voyager Digital Luggage Scale w/ 110 lb. Capacity & SmartGrip is a really simple way of making sure that you and your family don't get caught in that trap! It really is simple to use, very accurate and compact enough to take with you as you travel! One of the other things that we've been using our luggage scale for is to weigh Robyn's school bag to make sure that she's not carrying too much weight - she had problems with her back when she was younger and I worry now about how many books and things she needs to lug around on her back or in her messenger bag... I know it will come in handy again in a few years when Liam starts to face the same challenges. You can purchase your EatSmart Precision Voyager Digital Luggage Scale from Amazon.com and if you use the links in this post, EatSmart Products will be donating all of their referral money in June to The American Cancer Society. You can also get one directly from EatSmart and from other online retailers!